Aguahoja is an exploration of Nature’s design space. A collection of natural artifacts were digitally designed and robotically fabricated from the molecular components found in tree branches, insect exoskeletons, and our own bones. Here, we propose a novel water-based design approach and fabrication platform that enable tight integration between material synthesis, digital fabrication, and physical behavior, at scales that approach - and often match - those of natural ecologies. Fabrication Information Modeling and Parametric Chemistry are proposed as frameworks through which the designer can control the composition, form, behavior, and alteration of matter as a function of material engineering. Tunable biocomposites are fabricated via variable molecular composition and adaptive deposition. The resulting mechanical and optical properties are then utilized as inputs for computational design and digital fabrication across scales, thereby promoting full integration between robotic fabrication platform, material modeling, and form generation. Nature made us half water. With water, natural ecologies facilitate the customization of an organism’s physical and chemical properties—through growth and biodegradation—as a function of biological and environmental constraints. This cycle of birth, adaptation, and decay allows ecosystems to use materials in perpetuity. In old growth forests and coral reefs, waste is virtually non-existent. Within this framework, matter produced by one member of an ecosystem, living or nonliving, inevitably fuels the lifecycle of another. The result is a system fueled by water with unparalleled efficiency in the use of energy and resources. By contrast, the built environment is comprised of artificial, inanimate objects that are designed to perform a finite set of predefined functions. The pace at which we build these structures has required us to extract raw materials from the earth and appropriate them far from their native habitats faster than they can be replenished. When their function is served or outlived, they become permanent waste in our landfills and oceans. Upon malfunctioning or degrading, a majority of plastics, woods, glass, and metals are never recycled. Aguahoja recapitulates Nature’s material intelligence in the ways we design and fabricate the grown environment. Environmentally responsive biocomposite artifacts are composed of the most abundant materials on our planet - cellulose, chitosan, and pectin. These components are parametrically compounded, functionally graded, and digitally fabricated to create biodegradable composites with functional, mechanical, and optical gradients across length scales ranging from millimeters to meters. In life, these materials modulate their properties in response to heat and humidity; in death, they dissociate in water to fuel new life. At the local level, these relationships serve as parametric design inputs to algorithms that generate graded geometric patterns based on material properties. These patterns serve to either enhance or countervail mechanical and optical behaviors within environmentally specific areas of the structure. Regionally, these patterns are mapped to structural gradients that take advantage of the variability in mechanical and optical properties enabled by slight alterations to chemical formulae, multi-material interactions, and fabrication parameters. Derived from organic matter, printed by a robot, and shaped by water, this work points toward a future where the grown and the made unite. Aguahoja embodies the Material Ecology design approach to material formation and decay by design; it is a realization of the ancient biblical verse “From Dust to Dust”―from water to water. Resulting moths can produce 1.5 million eggs with the potential of constructing up to 250 additional pavilions. Affected by spatial and environmental conditions including geometrical density as well as variation in natural light and heat, the silkworms were found to migrate to darker and denser areas. Desired light effects informed variations in material organization across the surface area of the structure. A season-specific sun path diagram mapping solar trajectories in space dictated the location, size and density of apertures within the structure in order to lock-in rays of natural light entering the pavilion from South and East elevations. The central oculus is located against the East elevation and may be used as a sun-clock. Parallel basic research explored the use of silkworms as entities that can “compute” material organization based on external performance criteria. Specifically, we explored the formation of non-woven fiber structures generated by the silkworms as a computational schema for determining shape and material optimization of fiber-based surface structures. Continued research on the application of environmentally responsive biocomposites has led to the first architectural-scale iteration the Aguahoja series. Standing five meters tall, the structure’s skin is composed of a flexible biocomposite with functionally graded mechanical, chemical, and optical properties. The robotic deposition of cellulose and chitosan allows for the creation of a generative surface pattern that alters the stiffness and color of panels in response to environmental parameters such as heat and humidity. When exposed to rain, this biocomposite skin degrades programmatically, restoring its constituent building blocks to their natural ecosystem, thereby continuing the natural resource cycles that enabled their synthesis. Even small alterations to the molecular composition of biocomposites can have a dramatic impact on their appearance and behavior. 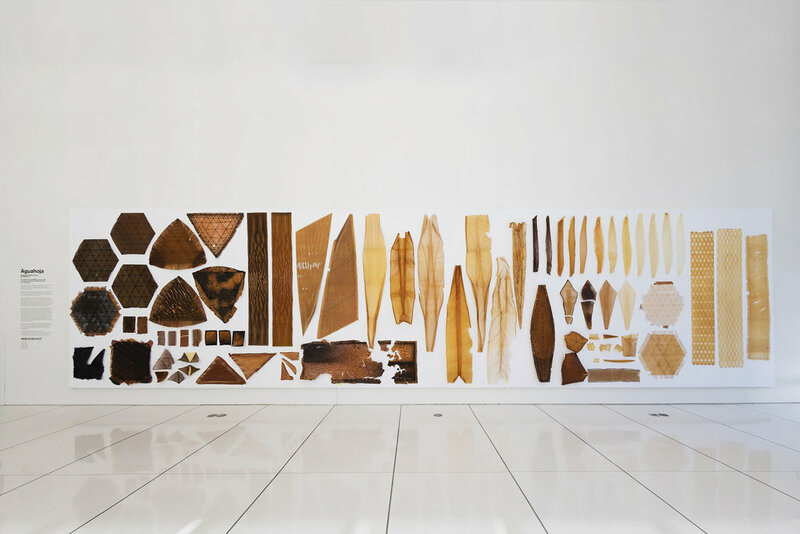 The Aguahoja Artifacts represent years of exploration into parameterizing material chemistry in order to develop a library of functional biocomposites. The pieces in this collection are diverse in their appearance, yet they are all composed from the same components; chitosan, cellulose, pectin, and water. 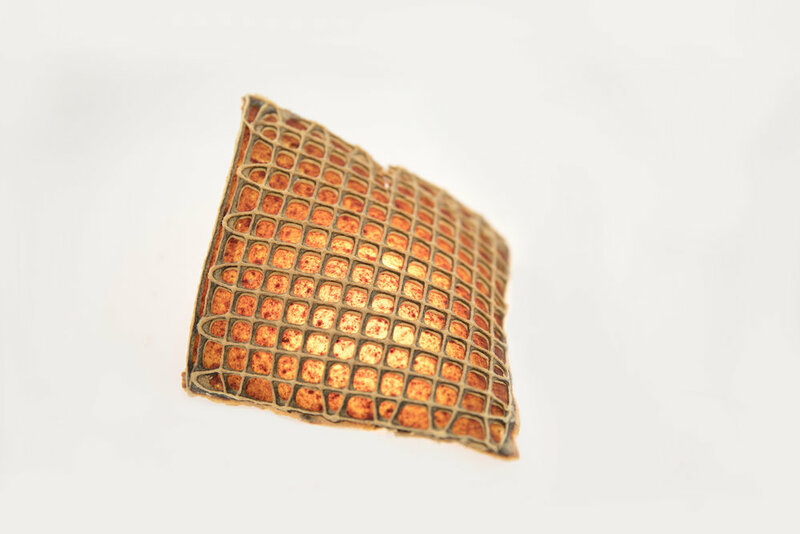 The array of forms and behaviors exhibited by these pieces reflects the manner in which they are expressed in nature, where a material such as chitin can compose both the exoskeletons of crustaceans and the cell walls of fungi. In contrast to steel and concrete, the composites formed by these materials are in constant dialogue with their environment. Some artifacts exhibit dramatic changes in conformation in response to humidity and heat, while others darken or lighten as the seasons change. Some are brittle and transparent with a glassy texture while others remain flexible and tough like leather. Despite their emergent diversity, these artifacts share a common quality - in life their properties are mediated by humidity; in death they dissociate in water and return to the ecosystem.